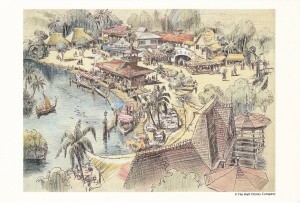 A little while back I posted on some original artwork by Sam McKim for Main Street USA. Those cards came from the Disney Gallery at Tokyo Disneyland. 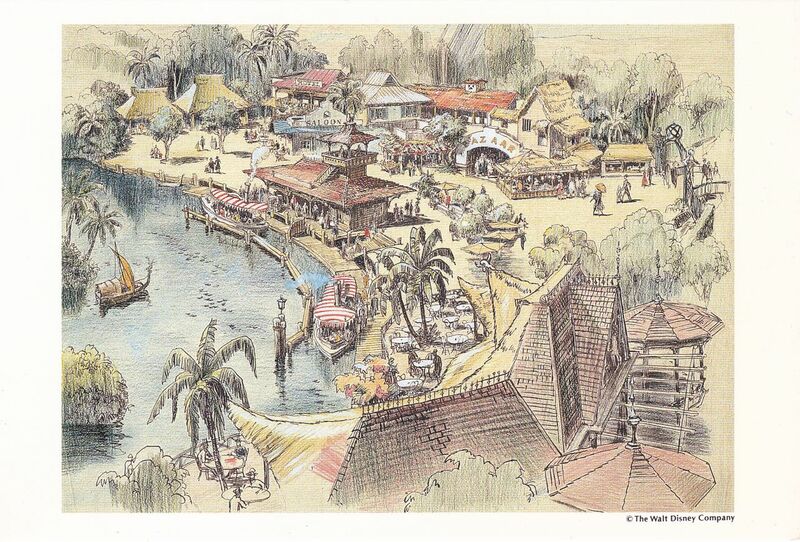 These cards today come from the same set and are really fantastic Harper Goff sketches of the the Jungle Cruise. Goff was tasked to work on this attraction (not ride…mind you!) in 1954 by Walt Disney. As the story is told in the Nickel Tour, Walt wanted a boat ride of some kind, something that might even use the giant squid from 20,000 leagues under the sea! Goff was a fan of the African Queen, the hit 1951 movie that starred Humphrey Bogart and Katherine Hepburn. 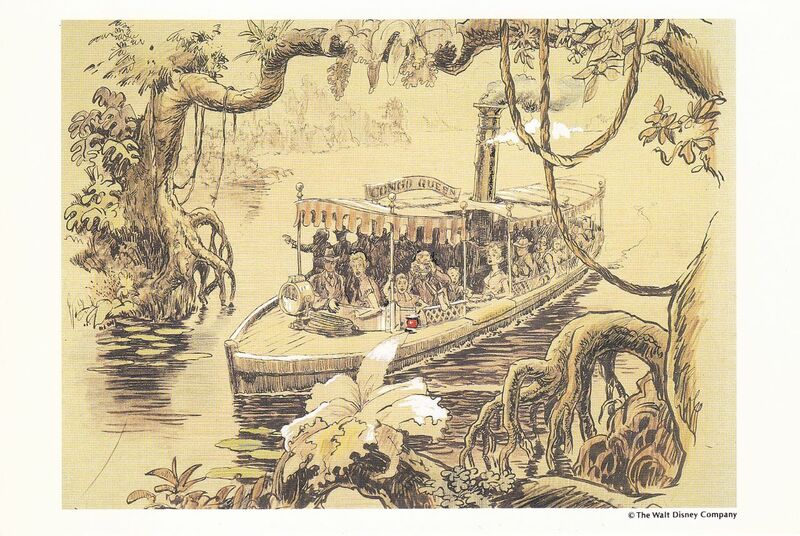 He pitched the notion of a jungle river cruise to Walt, and Walt let him run with it. Looking at the aerial view sketch, its clear that his original vision was executed without much modification. I have uploaded larger images of these cards, so do click on the scans to get a good look at the cards. They are just fantastic! I love the look on the lady who is sitting at the bow of the Congo Queen…is this journey safe?!? There are several more cards in this Tokyo Disney Gallery set…I will be sure to bring you more of them in the near future. This entry was posted in Disney Postcards, Disneyland Tokyo and tagged Harper Goff. Bookmark the permalink. Have this in poster size. They hang in The Disneyland Hotel. Have a couple copies. Just beautiful!